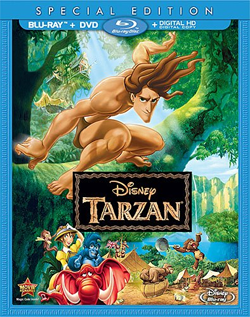 (Release Date: August 12, 2014)  Initially released in June 1999, Disney's 37th theatrical animated feature "Tarzan" continues to be a rip-roaring, thoroughly entertaining, emotionally true romantic adventure. Based on one of the most consistently adapted stories in all of literature, Edgar Rice Burroughs' "Tarzan of the Apes," the film took advantage of a then-new technique called Deep Canvas that was able to seamlessly move through CGI-enhanced 3D backgrounds. Suffice it to say, the picture is beautiful to simply drink in, but what most resonates are the affectingly written characters and the original songs by Phil Collins (including mega-hit "You'll Be in My Heart") that perfectly complement the onscreen action and themes. The stunning opening, played to Collins' lyrical tune "Two Worlds," introduces a young couple in perilous danger as they escape with their baby from a burning ship. Stranded in the jungles of Africa, the infant is found to be the sole survivor from a leopard attack. Kindly rescued by ape Kala (voiced by Glenn Close), the boy is rechristened Tarzan and welcomed into her ape community. As time passes, Tarzan grows up, aware of the physical differences that set him apart from his primate family but nonetheless at one with them. When Tarzan narrowly saves good-natured British lass Jane (Minnie Driver)on a gorilla expedition with her professor father (Nigel Hawthorne) and the smarmy, rifle-toting Clayton (Brian Blessed)from a pack of wild monkeys, he comes face to face for the first time with beings just like him. Gradually, as Tarzan's fondness for Jane grows, he finds himself torn between two completely different worldsthe one he grew up in, and the one in which he is supposed to belong. The animators tasks with bringing "Tarzan" to life really outdid themselves with this project. The film is a constantly absorbing piece of eye candy, with scenes of Tarzan swinging through the trees and another where he saves Jane from the attacking monkeys almost as exhilarating as riding a rollercoaster. Furthermore, one doesn't have to have grown up in the African jungles to identify with Tarzan's honest, universal plight over which life path he should take. The relationship he forms with Jane is sweet as can be, and their connection and gradual love for one another avoids contrivances. Voice work is inspired across the board, but Minnie Driver, as Jane, is especially winning. Bringing a surprising sassiness and life to her character, Driver earns the most unforced laughs and dramatic pathos the film has to offer. Tony Goldwyn is also excellent as Tarzan, pitch-perfect in his deep voice and expressions. Glenn Close is touching as Kala, her sad character finding purpose in raising this human boy while coming to terms with the death of her own child. Even Rosie O'Donnell, whose excitable gorilla Terk threatens to grate on the viewer's nerves, finds a drop of levity by the conclusion. The crucial decision which Tarzan and Jane make at the end is the only moment that doesn't sit well, taking away a certain amount of Jane's feminist self-assuredness while pushing aside the logistics of what this means for the star-crossed couple and Jane's father. Regardless, "Tarzan" remains everything a quality animated feature should be: intelligent, accessible to both kids and adults, and, most important, genuinely fun. The intervening years since its release have fortunately not stripped the movie of an ounce of its charm and potency. Eagle-eyed audience members with screen setups of 60" and larger may be able to spot a few rare and negligible instances of edge enhancement, but this is the only nitpick worth even a mention when it comes to the dazzling 1080p transfer Disney has gifted "Tarzan." The detailed intricacies of the background animation in each frame is never less than impressive, while the colors burst forth with pleasing radiance and sharpness. There is no banding, no aliasing, and if there was any DNR involved it went unnoticed. "Tarzan" looks like it could have been made in 2014 rather than 1999. Simply put, this high-def transfer is a delight. The 5.1 DTS-HD Master Audio is full and rousing in its own right, an impeccably immersive soundscape that gives every speaker a workout without overpowering the dialogue and more subtle ambient sounds within the sterling aural mix. Outstanding. Porting over nearly every special feature found on the collector's edition DVD edition but with an astounding uptick in visual and lossless audio properties, Disney's Blu-ray release of "Tarzan" gets almost everything right (the solo exception would be that all of said bonus content is still in fuzzy standard-def). One of the best of Disney's post-"The Lion King" animated features, the film is a grand entertainment that has never looked better than it does here. "Tarzan" on Blu-ray is a must-own.